"Community Banking" is more than a slogan — it's our business. Back in 1906, Judge Frank H. Robinson started the organizational planning of Maple City Cooperative Savings and Loan Association. In 1934, the Maple City Association merged with the Hornellsville Co-operative Savings and Loan Association, to become Maple City Co-operative Savings and Loan Association. The first officers were Dr. Clair S. Parkhill, President; George T. Rehn, Vice-President; James N. Robinson, Secretary; and William H. Walbridge, Treasurer. In 2001, under the presidency of Terry L. Bertram, Maple City Savings and Loan Association changed its charter from a NYS chartered Savings and Loan Association to Maple City Savings Bank, FSB, a federally chartered mutual savings bank. 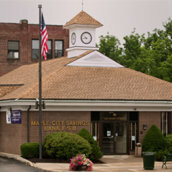 Maple City Savings Mutual Holding Company was also formed in 2001 under Bertram's leadership. Moving forward under our current leadership, Thomas F. Beers, Maple City Savings hopes to be firmly rooted in your future. "Community Banking" is more than a slogan-it's our business. Maple City Savings Bank is a locally-owned and operated independent financial institution with a strong financial presence in the Hornell area. We take care to maintain the quality service our customers expect while offering a variety of products customized to the needs of our customers. We take care to maintain the quality service our customers expect. The mission of Maple City Savings Bank, FSB is to be dynamic, locally owned and operated, independent financial institution. We will maintain a strong financial presence in the Hornell area with emphasis on profitability, safety, soundness and compliance, while maintaining the quality service that our customers expect. We will meet the challenge of competition with enthusiasm and effectiveness. We will provide our employees with challenges and opportunities for both personal and professional growth. For free checking with rewards, we're proud to offer Kasasa, an exciting new way to bank. Qualify to earn interest rewards and receive nationwide ATM fee refunds with Kasasa Cash®. How do you qualify? By doing things you're probably already doing, like using your debit card each month or receiving e-statements. Plus, when you open a Kasasa Saver® savings account, your Kasasa Cash rewards and ATM fee refunds will be transferred automatically for savings so easy — you don't have to do anything but qualify. We also offer I-Bank online banking & bill pay, so you can manage your accounts from your own computer instead of making the trip downtown. We also have I-Bank Mobile, which has all the capabilities of online banking — from the convenience of your own mobile phone or device. And just like Hornell is the upstate New York's go-to shopping hub, Maple City Savings is your go-to bank for home mortgages, lines of credit, and IRAs. If you own a small business in the area, see us about our commercial accounts and loan options. We also offer a suite of business services to make money management easier. Maple City Savings is a locally-owned and operated independent financial institution with a strong financial presence in the Hornell area. Conveniently located in beautiful downtown Hornell. Angela Weber, Customer Service Rep.
Mary (Teri) Pierce, Teller/Outside Sales Rep.